On the pages listed below you will find a selection of Real Ouija Board Stories. And if you have a spooky story to tell you can also post your own below. Some bring good news, some bring warnings, but ultimately you will no doubt want to get personal information from a Séance of your own. Are the spirits ready to talk to you? There is a lot of negativity surrounding the Spirit Board. But this tends to come from the energy of those who do not put their finger on the planchette. If you are a negative person you will tend to come up with all sorts of crap about all sorts of things. If you are enlightened with positive mind, you will come up with positive and helpful insights on all sorts of things. Scary is not necessarily negative. I remember playing with the Talking Board, as a kid back in Olde England, we would scare the beejeepies out of each other with all sorts of stuff and nonsense. Then in early adulthood I had been drawn back to the board with office work mates. Again I had the beejeepers scared out of me, but this time not so much stuff and nonsense. It was the fact that three of us with our fingers on any piece of furniture in the office, as light as you would place on a planchette, would have tables and chairs lifting and flying around the room in phantasmagorical style. There certainly is an energy when a group of like minds lightly connect in a spirit board fashion. There were a couple of messages from those early Ouija wanders that strongly influenced me over the rest of my life. Things like moving to Australia and avoiding the Middle East. But after developing my psychic ability in later life, I’ve never been drawn back to the board of spirit communication. Do Ouija boards work? Yes, and No, it is all down to you and your own attitude. Real-Life Ouija Board Stories and Lessons Learned. By using the form below you can share with us your own experiences (good and bad) around the Paranormal Psychic Ouija. Are there any Ouija board rules and instructions I should know about? What are the consequences of Ouija board sessions? How do I host a seance or party with a spirit board? How can I use a Pendulum with a Ouija Pad? Can you play a Ouija board by yourself? What do you say to start a Ouija board? What is the origin of the Ouija board? What are the happiest of Ouija Board Stories? 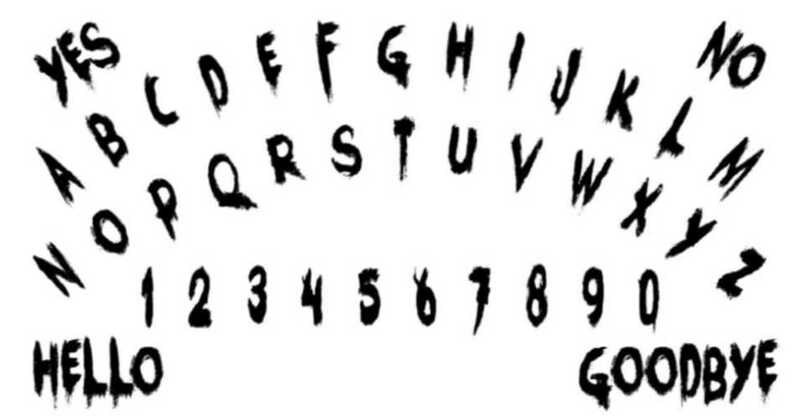 How to Make a Ouija Board - Paint letters of the alphabet directly on the board or table in an arc. Put A-M on the first line and N-Z on the next line. Add numbers 0-9. “Yes” goes on the top left and “No” on the top. Hello and Goodbye goes on the bottom. Do you have a story about Spirit Boards or something useful and interesting about the Ouija that our Psychic Junkie Readers would like to know? Share it here! Your Ouija article will appear on a Web page exactly the way you enter it here. You can wrap a word in square brackets to make it appear bold. For example [my story] would show as my story on the Web page containing your story. Do you have some Ouija pictures or graphics to add? Great! Click the button and find the first one on your computer. Select it and click on the button to choose it. Please rate and comment on the stories below . .